Released by WMS, Blue Lagoon’s theme is inspired by a tropical lagoon, with all the beauty that such a place can bring you being offered by the game as well. The game features only symbols which are appropriate for the topic it covers, which is not that often the case in modern titles, so it’s one of the things I appreciate about it. The design is also a reason to like the slot, along with the features it has to offer. 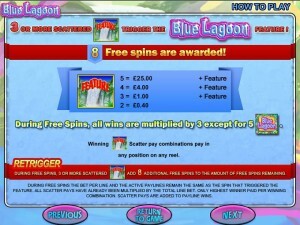 Players of the Blue Lagoon slot will find 5 reels and on them 30 paylines. 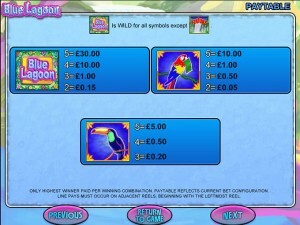 There are features which include scatter symbols, some wilds, free games and 3x multipliers. The biggest payout advertised is worth $15,000. If you get features active in this game, it will be either a wild symbol, or a scatter which brings you free spins and multipliers. 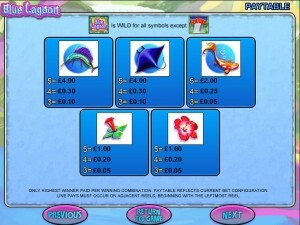 The Blue Lagoon Logo has been selected to act as the wild of the game, and at the same time to offer the biggest prizes that are available inside. Get the wild to form a combination with only symbols of its own, and you will get paid as much as 3,000 times the line bet you used that round. On the other hand, the wild will most likely be useful in its role as a substitute, taking the place of other icons that are needed in the spot where the Logo landed. The Feature symbol is the other major feature offered in Blue Lagoon. Its presence in multiple scattered locations will bring you a bonus feature and prizes. The prizes are offered when you have 2+ Feature icons, and they pay between 2x and 125x the bet. 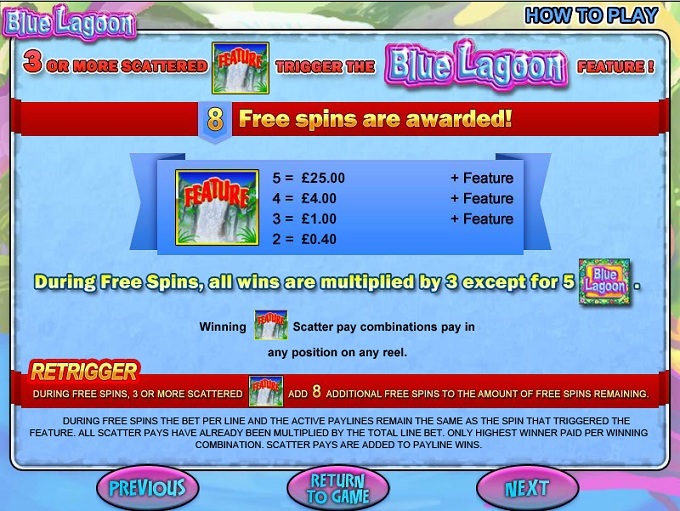 Getting access to the free games requires the presence of 3+ Feature Logos on the five reels of the slot, even if the exact location is not on a payline. You will be given 8 free spins if that happens, during which you get 3x the usual prizes, but only when it comes to combinations formed by regular symbols. The top jackpot, which is offered by the wild, is not multiplied. Retriggering the 8 free spins is possible, with another 3+ Feature Logos scattered on the reels. You might have only 20 lines in the game, but the wagers need 30 coins, 10 of which will be used to activate the features. Since the value of a coin goes as high as $5, the largest wager possible is worth $150. You are offered top prizes of 3,000 coins, which should mean up to $15,000 cash if you get the right five symbols. 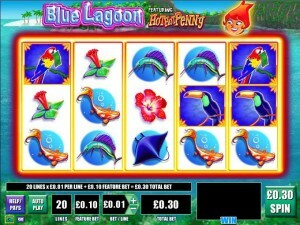 Blue Lagoon offers a pleasant experience, with the image of the lagoon being shown behind the game area, with a tropical jungle found on an island, with clear blue water and sandy beaches. The reels are filled with beautiful symbols that show off the jungle and marine life, mostly meaning fish and birds in this case. They’re designed very well, making the game a pleasure to play. 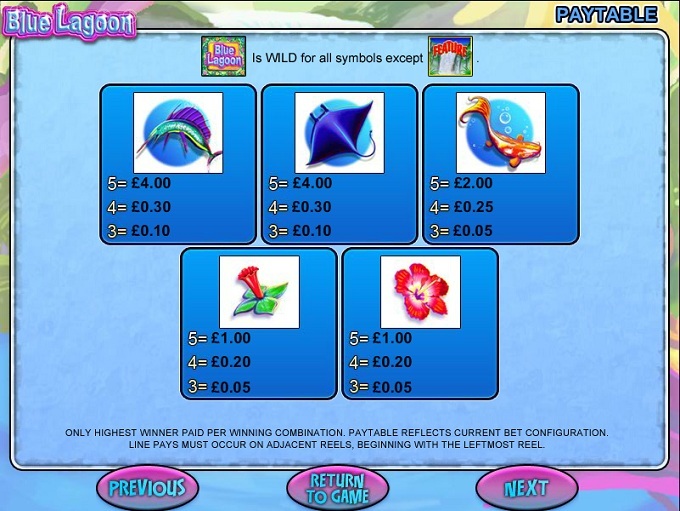 Symbols: Blue Lagoon Logo (wild, 3,000 coins), Feature Logo (scatter), Parrot (1,000 coins), Toucan Bird (500 coins), Swordfish (400 coins), Manta Ray (400 coins), Fish (200 coins), Green and Red Flower (100 coins) and Red Flower (100 coins). It has an appealing design, and the features can be exciting as well, but I’m not a fan of the system where you have to pay extra to get the bonus game active. The Blue Lagoon slot machine is offered through the WMS platform, so if you want to play it for real or just to practice, look out for casinos that use it.